The German state of Bavaria has rejected the USK rating of R18+ for Dead Space 2 on the PSP, meaning the game must be examined for the sixth time before it can be cleared for sale in the country. Germany is notoriously strict with videogame ratings. Games like Call of Duty: Black Ops and Diablo 3 both had to be censored to accommodate the country's game rating agency, Crytek has threatened to pull out of the country more than once and Ubisoft didn't even bother releasing the 2010 edition of Aliens vs. Predator in the country. 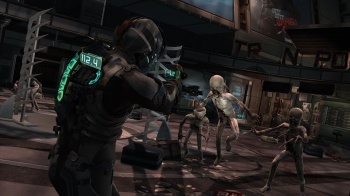 The latest game to fall afoul of those regulations is Dead Space 2, specifically the PSP version, which has had its USK rating vetoed by the Bavarian government. The translated report on the German site PC Games is a bit tough to put together but it appears that the Bavarian Ministry of Social Services gave Dead Space 2 on the PSP the thumbs down, overriding the ruling of the USK. No specific reason for the rejection was given, although the report notes that a previous test version of the game was turned down because players could injure each other with friendly fire in the multiplayer mode; the German version of the game will apparently have friendly fire removed. EA is none too happy with the decision, pointing out that the game has already been tested five separate times by the USK and calling on the government to end the process and accept the verdict of experts. The publisher has also put up a petition calling on gamers to express their opinions and support the release of the game. Dead Space 2 is slated for release on January 25 for the PC, PlayStation 3, Xbox 360 and PSP.